Stones used as weights to prevent an object from flying away in the wind, stones strategically placed to level out a bump in the ground, stones used to fill a small gap, and the stone that must be used inside when making pickles. In the summer last year, Motoyuki Shitamichi (1978- ) became interested in these stones after he came across many such landscapes in the coastal areas around Kurobe City Art Museum, in which the local people had gathered and used stones from the beach in their daily lives. Since that time, he has observed the casual manner in which these stones are used within the landscape. The surrounding area, with the large and beautifully shaped alluvial fan created by the Kurobe River, is designated as a field museum. Due to the short distance between the mountains and the sea, and the fanned edge of the delta being short, the shoreline does not consist of sandy beaches, but rather, is characterized by pebbled beaches made up of small round stones. The area is also known as the Forty-Eight Riffles. Before the arteries of the river unite into one, numerous riffles fan out in thin mesh like branches, particularly after long spells of rain, and with melting snow; and this characteristic of the area has long been recognized for making transportation difficult. For these reasons, digging the soil in the area will reveal numerous stones. Stones are also an integral part of the life of the people of the area. Stones from the riverbed and seashore have been used as objects of worship, and they are also used to build stone walls around homes and in fields. This landscape of stones has come to be due to the casual use of stones in ordinary everyday life. 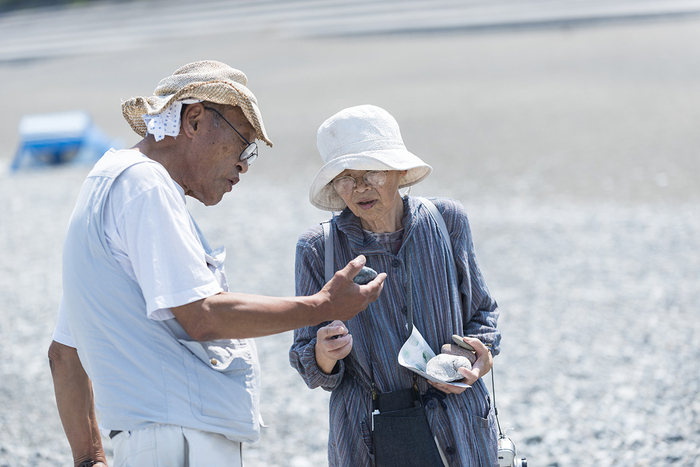 When Shitamichi turns his attention to these stones, it also leads us to notice the intimate relationship between them and the local people, and the landscape and topography that has been in the making for over hundreds of thousands of years. 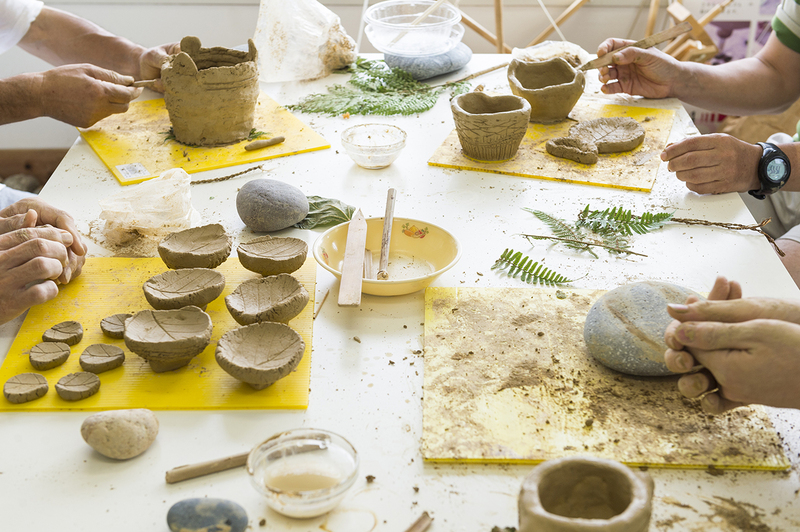 Since ancient times in Japan, stones have been used as objects of religious worship, implements and stone axes, stone mortars, fishing weights, or as signposts. They were also used as building or engineering materials. In folklore, which Shitamichi is deeply interested in, numerous examples entwining people and their use of stones have been uncovered. Shinobu Orikuchi discusses the sensibilities of dwelling in a stone in Ishi-ni ideiru mono. He points out the concept of utsubo in terms of internal space. According to Orikuchi, “The space is closed as if nothing could be accommodated by it, yet at the same time, it is as if the space has at some time or another, been specifically prepared to accommodate something.” Though he states that he cannot provide evidence of this concept with terminology such as the word utsuboki, used to refer to a sacred tree, “…the most suitable object which comes to mind is a stone.” With numerous examples of dwelling places of Gods and stone deities, people have provided the foundations for rocks to be used as a dwelling or representation of a God or spirit. An example that can be given as an appreciation of this is the karesansui, the dry landscape rock garden in a traditional Japanese garden. As shown in the concept of if it is hidden, it is a flower in Zeami’s Fushikaden, there is both profound and mysterious beauty in the concealed form, and the prospect of that hidden beauty revealing its true self. Just as we have the ability to be able to see the ocean in small stones spread in a garden, or a waterfall in a rock arrangement, rocks have been given a special place in the hearts of people as a device used to view a concealed landscape. stone (2016) consists of compositions which focus upon a main object, and we get the impression that the existence of each as a substance is being strongly thrust at us. Each and every form and substance is carefully conveyed, as if each has its own will, and is lingering in that spot. Looking at several of these stones evokes a feeling of brevity at the depth of time, the weight of hundreds and thousands of years. This round stone could not only be a fragment of a mountain cliff, but also a fragment from a planet, and we are viewing it from the immensity of the universe. Just as people once believed that Gods and spirits dwelled in stones based on their appearance, we too come to believe that it would not be so strange if some being were dwelling inside. Mircea Eliade stated that for the sculptor Constantin Brancusi (1876-1957), rocks were a holy manifestation. 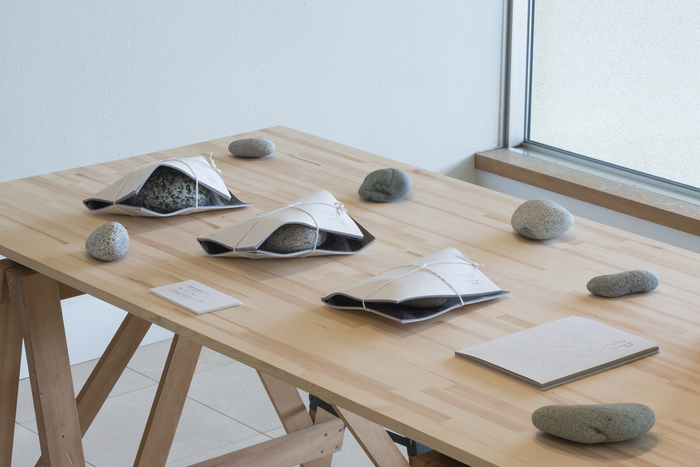 However for Shitamichi, we get the impression that the stone is a majestic and dignified mineral, eternally difficult to grasp. On the other hand, if we go back and forward between the scenes of numerous stones, and pay careful attention to the background and circumstances, we can imagine the landscape extending from these seemingly cut-out screens. In doing this, we see that each is an incredibly routine and casual scene from a certain area. Though our imagination has flown to the universe, thoughts of an unremarkable daily life vividly come to mind. The very size of this stone is what led it to be an object of worship, while at the same time it was the reason that it also came to be used simply as a daily utensil. In the metaphysical, in the cosmos, in space, and in the mundane, his works capture this polarity, each stone maintaining a balance between the depth of the stone itself, and the common and mundane daily landscape. 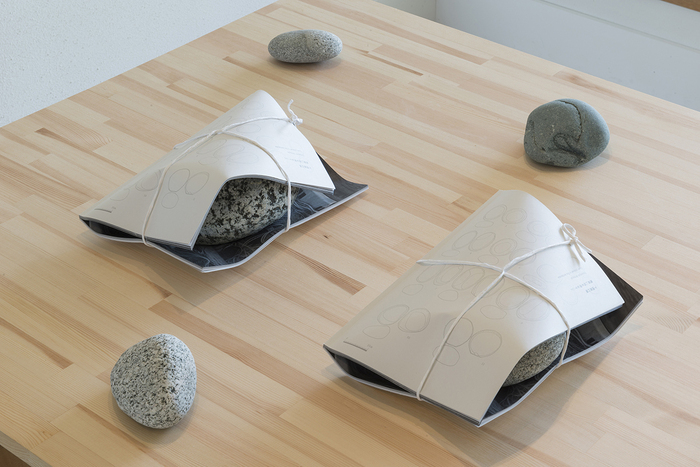 In addition to this, Shitamichi believes that a stone itself has no role, rather, it is people who give the stone its role and value. 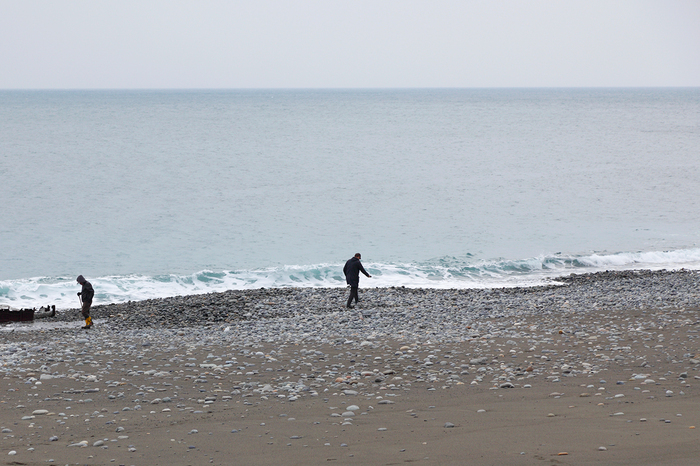 For example, people gathering stones at the riverbed or seashore choose these based on ever so slight differences in weight and size, bearing in mind what the stone will be used for, and then choose the perfect stone to take home. Just as a switch is turned on or off, what was once just a stone is endowed with a purpose. At The Jomon Village in Toyama Kitadai National Historic Site Prefecture, stone tools, which maintain the original shape of the stone, are on display. To give a rough approximation of the size of the stones, each would fit into the palm of your hand. There are beating stones, slightly longer, that seem easier to grasp, stones with a pit, flatter with traces of an indentation in the center, as if they have been used as saucer for a Beatingr stones, and almost perfectly round stones that must have been used as grinding stones. 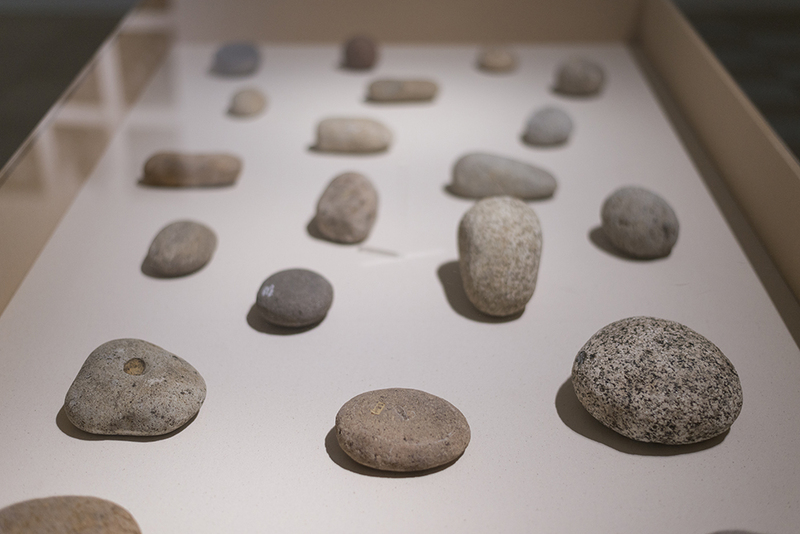 People in the Jomon Period chose and used these stones based on ever so slight differences. There must also have been stones that they picked up, and did not use for some reason. Those stones are surely still lying around somewhere even now. 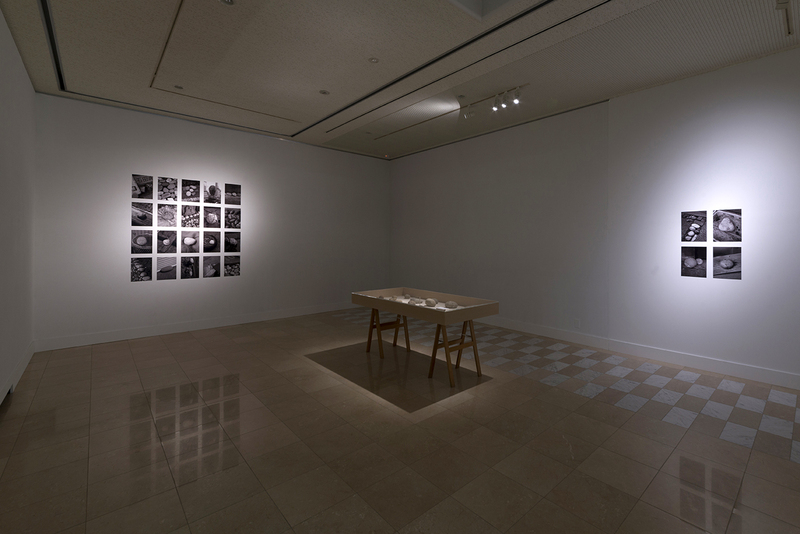 The display of black and white photographs makes it difficult to pinpoint the era, encouraging us to imagine whether the stones and their activities which Shitamichi has captured, are part of the present age, or from a time in the distant past. 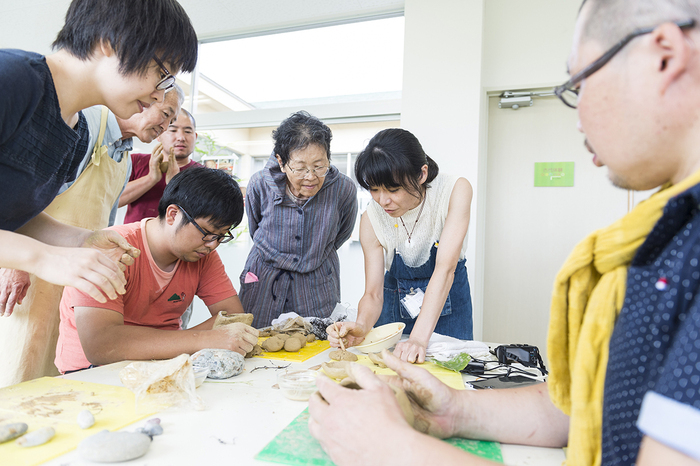 In researching stone, we enlisted the assistance of Takashi Kubo, curator of the Kurobe Yoshida Science Museum, and Noriko Kawabata from the Asahi Town Center for Archeological Operations to provide guidance in the local area. Kawabata specializes in archaeology, and deals with time spanning over tens of thousands of years. Kubo specializes in paleontology and hundreds of millions of years. In conversations with these two specialists, and comparing Shitamichi’s viewpoint with their interests, again we realize that he has captured the life of the people with overwhelming definition. 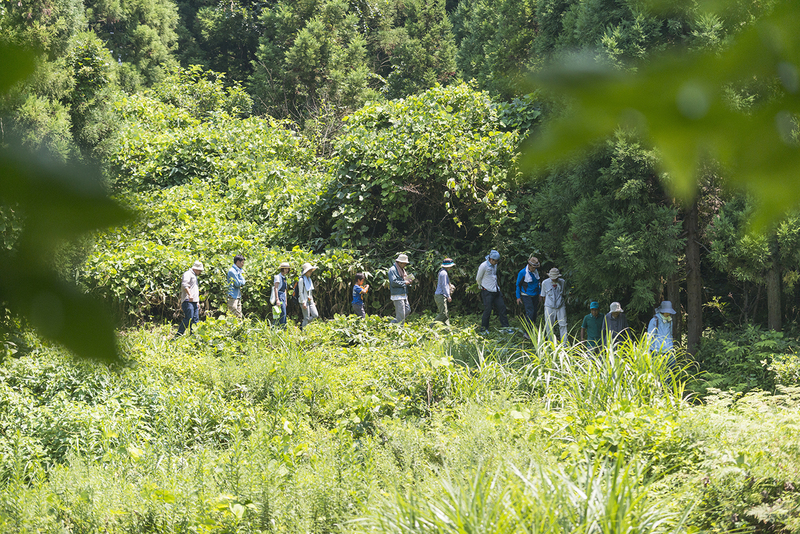 Just as folklorists assiduously research the folktales and oral traditions of the villages in each region, Shitamichi also visited the area, closely observing and gathering information to create his works. He informed us that when he was a child, he personally investigated nearby shell middens and burial mounds, and we can imagine scenes much like an archaeological dig. While he captures objects on the surface, he also carefully considers the stories, memories and events of the landscape, and after editing these, presents them as a work of art. Such works can be seen as a study in modernology, and have at times been given this pedigree. 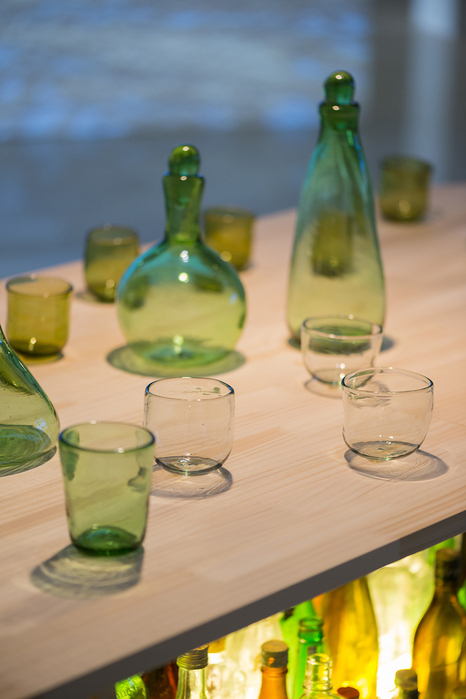 In their research in modernology, Ren Fukuzumi, Wajiro Kon and Kenkichi Yoshida have found a common denominator with art, stating that “…the observer is, therefore, someone who strides through overlapping regions in art and science.” This could also apply to the stance of Shitamichi. 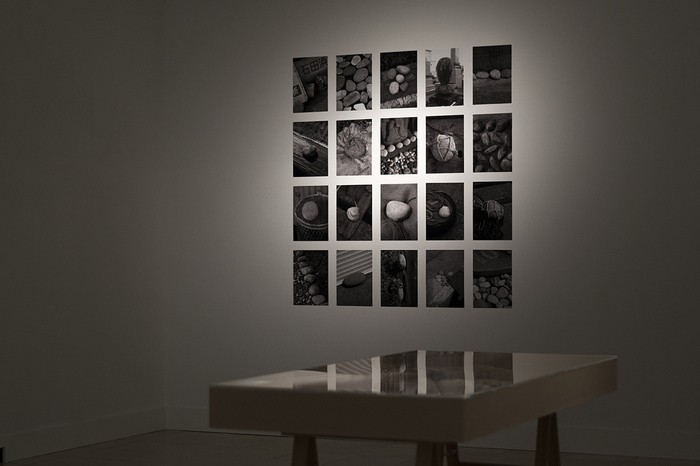 The polarity in stone, and the diversified viewpoints, is visible in each individual piece of work, and can be seen even if previous series of works are overlooked. Works with historical events as their background, such as bunkers (2001-2005) which covers the ruins of former military bunkers still visible in various parts of Japan, and torii (2006-2015) which observes the forms of torii (gateways to shrines) built outside of Japan during the Colonial period, also document the vastness of nature, and enormity of the passage of time. On the other hand, bridge (2011), a collection of works capturing bridges made from wooden planks and steel plates suspended over ditches and paths in rice fields; crossover (2012) showing traces of paths made when people or animals step over boundaries; and Mother’s Covers (2013-2015), a record of tissues or plates used as substitutes for lids; were made showing the tiny behaviors within everyday life, originating in the daily affairs of the private life of the artist. The gaze of curiosity has been poured into these in equal value, and the beauty within each of them discovered. Furthermore, within each of the works, multiple concepts are included: to disappear or remain, transformation, wandering, movement, memories, traces, boundaries, value, and meaning. 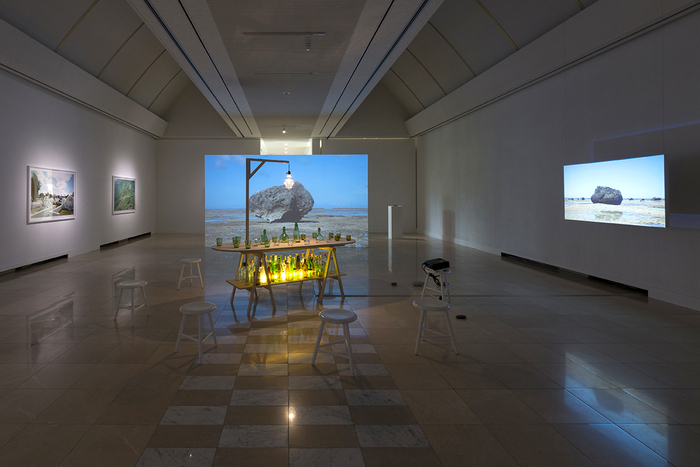 For example, in Fragments of borders (2012- ), he collected water from rivers which separate communities, and the barbed-wire entanglements of the Korea University. It is possible to imagine the history of the people whose lives were hemmed in by these borders. Further, the fragments of the borders collected are social boundaries, visible only to those people who are aware of them. If we think of them as simply being a substance, speculation regarding their value and meaning is born. In this way, various realizations are derived from the layers in each work as the viewer’s understanding of them deepens. Also, as the exhibits are composed using diverse methods including photographs, film, actual objects, texts and documents, it is possible to share the sense of Shitamichi’s fast-paced process of observation and discovery, and ponder various matters together. 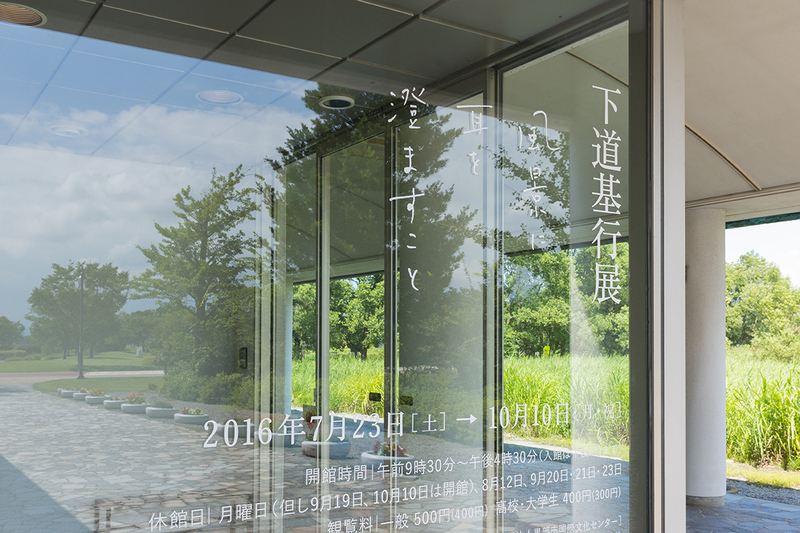 This exhibition attempts to re-examine the strength of yo(purpose) in several series of Shitamichi’s work. His interests can be traced back to his initial works, and it can be seen that these interests remain the main subject that he continually confronts in producing his works. torii is a collection of works covering the forms of torii outside the borders of Japan. These torii were constructed as Empire of Japan policy, and even now, though the war is long over, they remain where they were built, changing their forms. The barely visible torii still standing in the dense forest; the torii lingering on grassy plains in full view; the torii that has been converted into a gate to an institution; the torii being used like a telegraph pole by the house built near it, complete with electrical wires and an antenna; and the torii which has been toppled over and is now being used as a bench. When the original meaning of an object has been pushed away by a community that shares the same culture and values, we can see with our own eyes the loss of the original meaning. It is clear that these are remnants that symbolize the memory of the Colonial Period. On the other hand, if I am to write without being misunderstood, these torii all linger beautifully within the photos; and in some we can sense the atmosphere of daily life. When I first saw the torii series, I remember feeling an impression of multiculturalism first, rather than recognizing and trying to understand the differences in cultural meanings and values. The thoughts that people hold towards the works will no doubt differ greatly depending on the consciousness of the viewer, and the generation to which they belong. However, what leads to the tolerance of various interpretations is the fact that the artist takes a neutral viewpoint, and is attempting to interact with the torii in their current form. This is similar to maintaining the equilibrium as seen in stone. Precisely because the subject with its one directional propaganda is so fascinating, we can tolerate approaching it from a free point of view, and it is then that we first other elements such as the beauty, and the ordinariness of it. In bunkers, Shitamichi embraces his interest in the circumstances which have been forgotten in the ordinary. In this series he captures ruins of military facilities that have not been monumentalized, and are used either as vegetable gardens or as storage for private homes. He thought their appearance to be beautiful. This concept is also common in torii. These subjects have lost their original function, and through the passage of time, and changes in the environment, their value and meaning has been overturned. Shitamichi is incredibly attracted to the strength of change and purpose, as well as the ordinary aspects of daily life. For him “…meaning which was forced through authoritarian means, has unconsciously been turned upside down by the citizens in their everyday life.” For example, the fact that people now use the fallen torii as a bench in a park in Taichung, in Taiwan, has completely stripped it of its meaning as an authoritarian monument. There is far more power in this than the strength required to actually topple the torii. He also searches for this in his own actions. While grasping the history of battery ruins, in Re-Fort PROJECT (2004- ) he attempts to examine an appropriate use for these in current times. 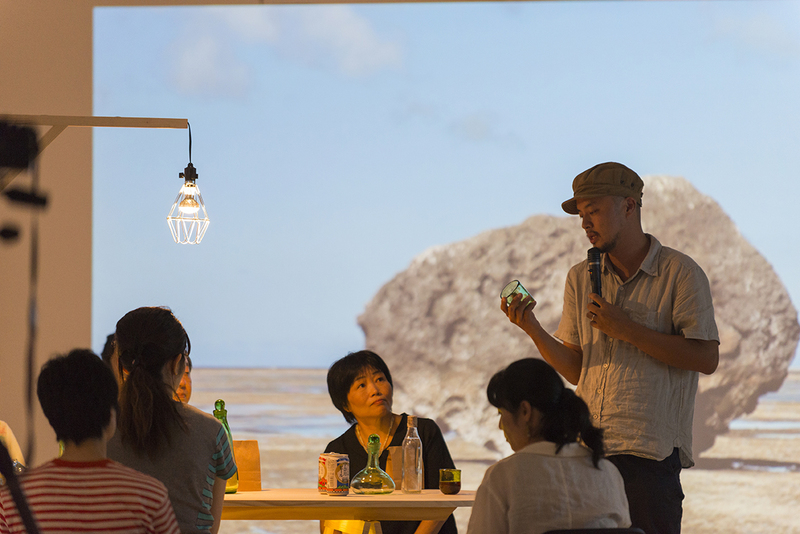 For example, he has played kick the can there, organized a blossom viewing event, and even attempted to renovate a building and live there, believing there is meaning in the daily act of changing something proactively. In addition to this, while considering glass artisans in Okinawa re-used coca cola and beer bottles of the United States forces stationed there to make colored glass, he came upon the idea for a project to re-use glass that had drifted ashore to make objects such as cups in The monument of “float” (2014- ). 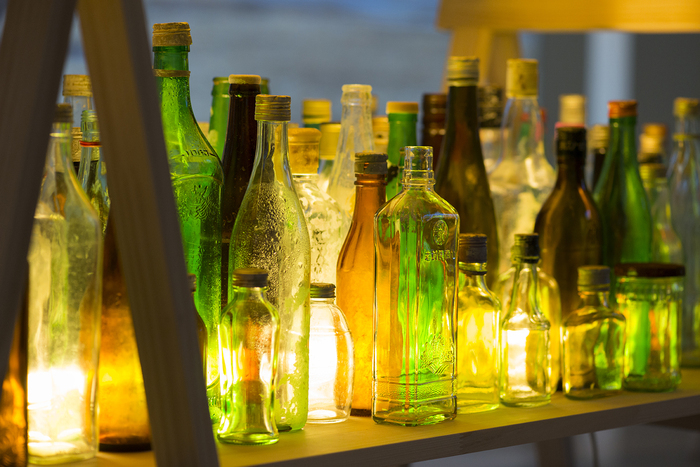 He also purchased and exhibited Okinawan handcrafted goods that had been made using World War II fighter aircraft in Duralumin Plates (2004). The ordinary act of converting an object, is in other words, removing its original yo(purpose). Shitamichi does not just beautify an object one-sidedly, but also examines the effects and phenomena with a broad perspective. However, we must recognize how far these acts have caused history, memory and the landscape to progress. In works to date, the day to day act of putting an object to another use appears side by side with war and aggression, providing a sharp contrast. This relative awareness of the mundane, and being able to turn towards society, bears the implication of a positive existence. Through bridge, which Shitamichi produced after the Great East Japan Earthquake, he once again turns his gaze to the everyday landscape. What he discovered in that, was a landscape of people converting objects by hand. Stones can also be thought of as an extension of this. Moreover, it becomes expressly apparent that stones which originally have no meaning, are given a role and value, and are used for a specific purpose. Together with this fundamental viewpoint, layered with the vastness of time the stone has seen, the intensity of time and universality can be added to purpose, which has to date been examined centering on modern times. Shitamichi moves towards the future while travelling through the past. At times, discovering the workings of stones, at other times, feeling the history and memories of stones. While going back and forth between the micro and macro, he gazes intently at the invisible tales layered within the landscape. Compared to the hundreds and thousands of years of time stones have seen, our existence is but a grain of sand in time. Even so, with the accumulation of the ordinary, we are moving the landscape, and the world, forward.